I was the only guest up while James the crew member set up breakfast. It is really windy outside once again. I’d just like it to be calm and warm. We dove Half Mile and Double D today. Great dive sites. I took some really fun pictures. There were lots of fish under the boat to play around with. At Double D there was a big grouper who liked to hang out under this alcove. I found him there on the first dive and he swam away pretty quickly. So on the second dive I went right back there and he was exactly in the same spot. He stayed a bit longer but really wanted nothing to do with divers. On the late afternoon dive I got to photographing a bunch of snappers under the boat and was chasing them. Before I knew it, I looked around and the boat was nowhere to be found. Oops. I surfaced and thank God I did because I thought the boat was in completely the opposite direction. I gave an OK signal, but I don’t think anyone even noticed that I surfaced away from the boat (and alone). On one of these islands are a bunch of monkeys. As the story goes, a boat carrying a bunch of animals crashed. They rescued the people but left the animals. Most of them didn’t survive but the monkeys did. Still to this day, they can be found on the island. Then the night dive was pretty cool. I found a neck crab and an arrow crab with babies! But the best part was that I found a nudibranch on my own. I think that this one was different. I’m still not sure exactly which one it is. Of course, I found it right at the end of the dive when I was low on air and bottom time… but I had to get the shot. I worked so hard at it but only like one out of every five shots was in focus. I wasn't sure exactly which one this is, but I had Flabellina engeli written down. After googling it and going to to Nudipixel, I confirmed it. 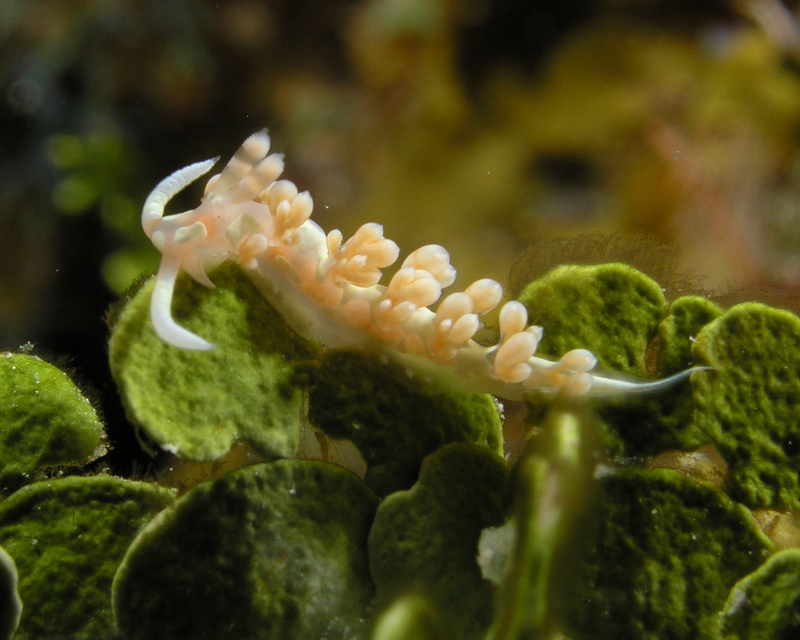 See Dave Behrens' comment: This aeolid nudibranch is characterised by the 3 large opaque white spots on the head – one connecting the bases of the oral tentacles and one on either side of the ‘cheeks’. As a sidenote, the picture on Nudipixel is Anthony Hollis'. I was just diving with him in Sept/Oct on the Cheng Ho and Villa Markisa. Small world. I’ve been a pretty bad diver, getting lost and going into deco. Oops. But I am having a ton of fun doing it. At night I wrote a note to Santa and left it out with some cookies. I hope he brings us something fun in the ocean tomorrow!